Filming the 14th-century Chinese novel Romance of the Three Kingdoms is a bit like trying to tell all of Shakespeare’s Henry plays in one movie. It’s certainly ambitious, possibly heroic, and nearly impossible. Unabridged, the epic exceeds 2,000 pages and includes a cast large enough to make Robert Altman sweat. There are earth-scorching battles on a massive scale, endless naval armadas crowding the Yangtze River, labyrinthine military strategies, intricate tea ceremonies, and even a few guqin solos. Red Cliff begins rockily, then takes a good half hour or so to find sure footing. Woo’s worst idea is to include a hyperbolically grave narration that sounds better suited to a movie trailer than to an actual movie. 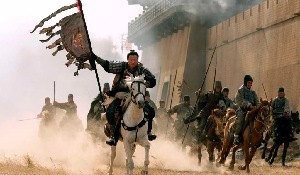 After an initial scene in which the rogue general Cao Cao (Fengyi Zhang) persuades the emperor to allow him to unite the three kingdoms by force, Woo cuts quickly to a battle, in which the opposing armies try to route Cao Cao and defend fleeing civilians. It’s an awkward mise en scène, stranding the audience in a complicated political and military situation with little guidance. During these scenes, Red Cliff introduces so many characters so quickly that keeping them straight demands a flow chart. But then there are the battles themselves. In China primarily but also with his string of mostly unsatisfying Hollywood movies, Woo has specialized in portraying violence with slo-mo grace and a striking beauty that makes it seem either deeply heroic (Hard Boiled) or just silly (Face/Off). In those movies—which are, like almost all of his films, set in the present day—the action was limited to a few characters engaged in stand-offs and shoot-outs. In Red Cliff, he explodes the violence in scale: It’s not just a few cops shooting at each other, but thousands of soldiers attacking with spears, arrows, lances, swords, shields, maces, and an array of blunt instruments. The director keeps the action clear, concise, at times elegant, even as blood splatters across the camera lens. Despite its length and historical setting, Red Cliff is a recognizably Woo film. As impressive as those set pieces may be, the film’s best sequences center around the battle of wills between the two armies, who constantly play dirty tricks on each other to shift the odds. Some are dastardly (an early form of germ warfare), others so ingenious I won’t ruin them here (although I will say that the nighttime raid to steal hundreds of thousands of arrows was a highlight). Despite the mishandled exposition, these set pieces are fleet in their gimcrackery and concise in their visual wit. Red Cliff may bear little resemblance to Woo’s previous work, but at its core, it is simply a magnification of those ideas and themes, espousing the same general ideals as Hard-Boiled, A Better Tomorrow, and even Mission Impossible 2. Bravery and cunning are prized above all else, and the line between right and wrong is sharply and deeply drawn. Heroes behave heroically, villains villainously. Red Cliff is a black-and-white film, but there’s enough red here to keep it interesting.